The Moonee Valley Cricket Club held our Most Valuable Player awards at the Laurel Hotel on March 11, and the worthy winners of our prestigious awards were crowned. Votes are cast on a 5-4-3-2-1 basis for each game of the season, so the awards sort out the week-by-week contributors from the flash-in-the-pan players. 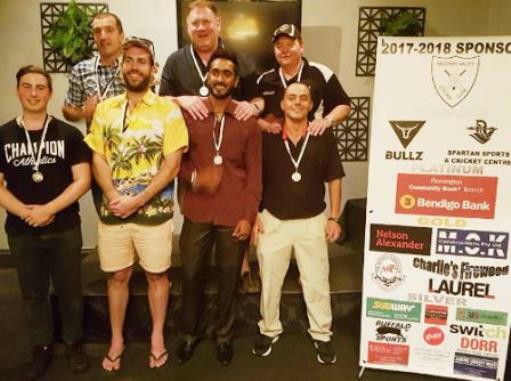 At right: Our MVP winners: L-R Matt Esmore (3rds), Jim Polonidis (2nds), Liam Farrell (6ths), Simon Thornton (4ths), Chanaka Silva (1sts), Mark Gauci (7ths) and Danny Terzini (5ths). The votes were cast round-by-round on an electronic screen - thanks to Peter Golding's computer expertise - and while some of the voting was close, we had a couple of runaway winners in the grades. Winners in all seven grades were in attendance on the night to receive their MVP medallions. The night also counted the Fieldlow votes in each grade, and the Fielding Award trophies will be presented at our Presentation Night at the Moonee Ponds Club on Aprl 14. Our thanks to the Laurel Hotel in Ascot Vale - one of our major sponsors - for hosting the night, and to Peter Golding and Simon Thornton for tallying ad compiling the votes. Thanks also to Michael Ozbun, Matt Thomas, Channa DeSilva and other members for organising the venue and the night. The MVP was a good bookmark on the long weekend to a hard-fought two days of finals, and enabled our Firsts to let their hair down - briefly - after their hard-fought semi final win. It was also a chance to acknowledge the Thirds, who came agonisingly close in their semi final after recovering from a tough start with the bat. It's also important to acknowledge that two of our other teams - the Sixths and the Sevenths - pressed a couple of weeks into the finals before bowing out. And our Under 12s and second Under 14 team are still in the thick of finals, with crucial games this coming Friday. For more pictures and detail from the MVP, click HERE. We’ve now vacated the Ormond Park rooms to allow construction to start on the long-awaited new $2 million pavilion. It’s been an eager build-up since our local ward councillors Jim Cusack and Nicole Marshall pushed through the rebuild in the 2016 Moonee Valley Council budget, but it’s now set to take shape on the ground. We moved our last gear out of the old rooms on February 28, into storage in our shipping container, and have now taken up residence in the portables on the north west corner of the playing field. Fittingly, the move straddled the 300th game of club legend Mark Gauci – we played the first day of the two-day game against Jacana out of the old pavilion, and completed the outright win on Day 2 operating out of the portables. Above: The "Starlight Lounge" clubrooms - 300-gamer Mark Gauci (left) gets used to our temporary social area while our new clubrooms are built, while the Sixths take up a table in the background. Our temporary complex comprises a bar/canteen portable, three changerooms – one for the umpires – and two toilet/shower blocks. 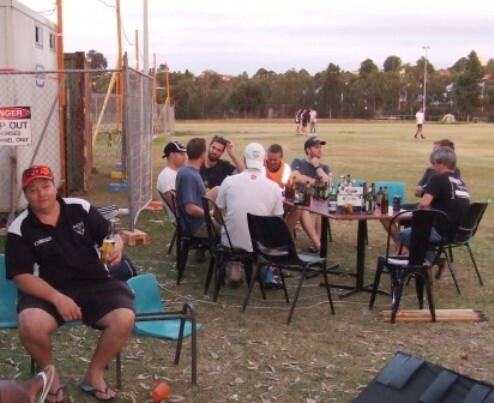 After the outright win over Jacana propelled us to third on the ladder and guaranteed the Firsts a spot in the finals, we were able to celebrate in the “Starlight Lounge” – the parkland around the portables. Our temporary liquor licence incorporates the same days and hours of trading that we had in the old pavilion, and allocates us an ample outdoor licensed area to incorporate plenty of viewing of our games. We will be handing over to football in the coming weeks for the winter season, and then expect to operate out of the temporary digs for all or most of the 2018/19 cricket season. While there will be disruption for our players, supporters and members while the project rolls out, the inconvenience will be worth it when we move back into our new pavilion. We’re continuing to liaise with the Council over the temporary facilities, including measures to best protect players and supporters from the weather, and will continue to update our members as the work progresses. fellow 300-gamers John Talone (front left) and Joe Ansaldo (front right). Dual Premiership captain and past coach Mark Gauci has joined an elite club at Moonee Valley – one of just five players to have brought up 300 games. 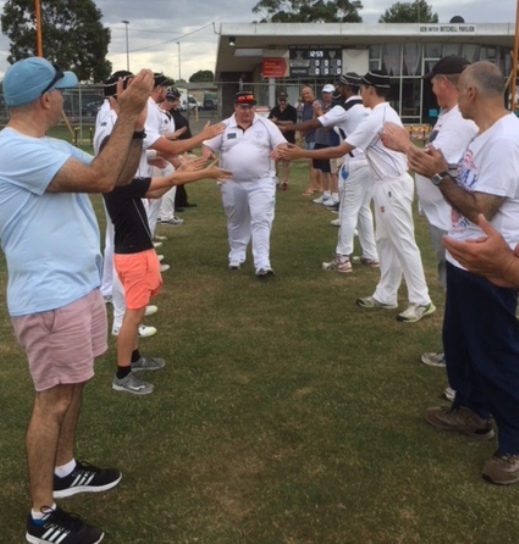 The Gauch reached the milestone against Jacana on the February 24/25 weekend, and ran through a guard of honor at our Ormond Park home ground as the First Eleven took to the field. At left: Brothers in arms - four of Moonee Valley's 300-gamers: L-R Mark Gauci, Darren Nagle, Joe Ansaldo and John Talone. Three of the other 300-gamers – Darren Nagle, John Talone and Joe Ansaldo – were part of the honor guard, while Ian Denny sent his congratulations. Mark’s glittering career has reaped more than 6500 runs and 250 wickets since he joined our club in 1998/99, and includes captaining the 2009/10 First Eleven Premiership and the 2014/15 Sixths flag. He was our First Eleven captain for eight season from 2005/06, coached in the 2015/6 season and had a term as vice president of Moonee Valley. Below: Our history and our future: Mark Gauci gets ready for his 300th game, sharing the changerooms with Moonee Valley's future - L-R 22yo Daniel Comande and teens Nigel Cowan and Anthony Cafari. The accolades flowed long and fast for the Gauch and his contribution to our club - and it was probably fitting that the celebrations of his milestone were also the last official function in the Ormond Park clubrooms before they're pulled down and rebuilt in our $2 million redevelopment and expansion. The new clubrooms are part of our future - and we're sure Mark Gauci will also be there as part of our bright new era. *Thanks to Dean Jukic for the photographs. Anthony Leonardo turned out to be our King of the cards when Moonee Valley held its life members function and poker night on February 17. 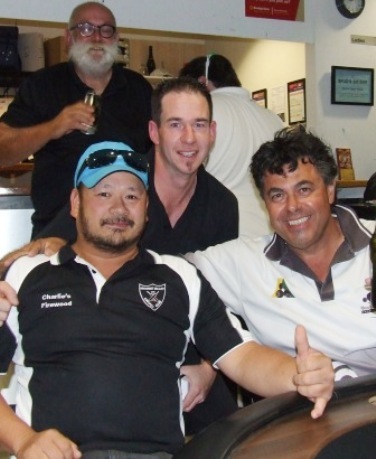 Leo won through to the final table, and held off a determined effort from past player Mick Intagliata to claim the first prize. The poker night is an annual event for our club, and is a major fundraiser for our budget. 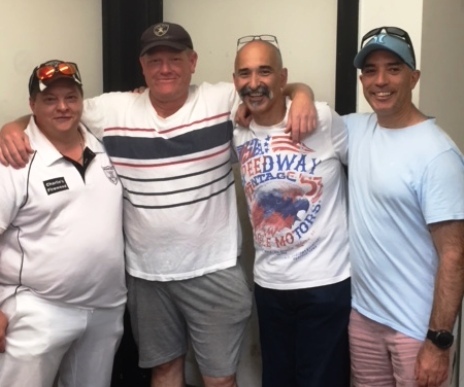 At right: Our official card sharps - winner Anthony Leonardo (left) and runner-up Mick Intagliata (right) with organiser Kav, and with Michael Felle keeping a watchful eye for any missed aces. About 40 of our cricketers, as well as friends, family and outside players, were part of the tournament, and the cards flowed thick and fast as we worked towards the final table. Thanks to everyone for their efforts. Moonee Valley Cricket Club trains at Ormond Park on Tuesday and Thursday evenings until the end of the 2017/18 season. We have seven senior sides - four on turf and three on hard wicket, and a range of Saturday and Sunday games to suit all options. Anyone interested in joining our successful and progressive club for next season can phone coach Lou Raffaele on 0450 181 948, or Club President Charlie Walker on 0411 705 381.